Yup, there is the oil grove from hell ! As you have been running the cams for a few weeks & are going to install another adjustable cam wheel it might be a good idea to take pictures of the #1 journals to see if there is any unusual wear & check how wide your grooves are. Damn, and according to BC it's ok/no problem? both #1 oil supply holes are mostly blocked. Did you get a chance to check your's out cuel? Yup. Same oil groove. I compared it to a set of stock cams I have as well, and its a bit wider(maybe 2mm? ), and the hole looks bigger as well. The blockage in the first hole is actually the bottom of the bolt hole for the cam gear. I looked in it(oil hole in the journal) with a flashlight. I blew compressed air through there, and got nice flow through the rest of the journals, so it might not be a big problem. I compared the oil groove to the cap as well. If you look carefully at a set of stock cams, the hole for that oil groove is chamfered all the way to the top of the first journal. The oil groove on the BC cam(which is chamfered as well) is(very close to) the same size as that chamfered hole. I think Crower was trying to improve oil flow through there, maybe? Might allow you to drill out the oil passage in the head a tiny bit to increase flow to the camshaft? Is the first journal where the cam receives oil from the pump? I think the main problem with this would be if the journal doesn't sit perfectly centered on the head and cap. I think as long as it's centered well, it shouldn't have any problems. Does anyone have a chart or blueprint of the head that would show direction of oil flow, and if maybe that oil passage could be opened up a little? I'm pretty sure that oil comes through that first journal, then on through the cam, but would like to be positive. I also noticed that none of the holes in the journals were chamfered, and seem to be pretty sharp. Before I install them, I'm gonna change that. I really don't like sharp edges there. When you have installed your cams can you please report if you have similar issues with the static ignition timing? No problem. It'll be a while yet, I'm in need of a few more things(I changed my plans in the middle of the build. Hate it when I do that), and am gonna have to put it on hold until after Christmas, unfortunately. This should hopefully improve my idle and may allow me to run less advance on the cams. The lobe seperation angle on these cams is 114 if installed at 0 & 0. How close are you to getting your cams in?? I have tried two settings over the weekend. It is suprising how much smoother the engine revs out now. I was convinced before that the 7M engine didn't like high rpm, but now it revs strongly and smoothly with these cams. The kickdown is really nice when you just give it a blast when your cruising along. ATM both my cams are set at +3 advance and as stated above with slightly increased valve lash over what the BC timing card recommends. I think I will just drive around and enjoy it for a while. I was also thinking that maybe you could trick the ECU into thinking the Air Con was on all the time and this would automatically set the idle speed higher. Might be the easiest way to get a silky smooth idle. Might also allow me to run a little more overlap and get even better top end. My TODA 264s just dialed in at 114 lobe centers when set 0-0. This is more of a forced induction lobe seperation. I am going to dial in less seperation to start off. and 2deg advance on the intake. This will give me 110deg on lobe centers. After the engine is broke in (not blown up), I will play with it more. By the way, a Toda 264 when checked at .010" lift, came out to 260deg. Any less than 114 LSA and it won't idle, atleast with the air con off. Air con on and maybe 112 is acceptable. At my current setting of +3 advance on both cams I get good performance throughout the rev range. Interesting thing is no sign of any pinging even with 15 deg static ignition advance. I think with these cams you could use a higher compression ratio than standard. Anybody building up a motor with these cams might want to keep this in mind. I used to run 10-15 additioanl advance when the engine was stock. I may not be able to do that now, because I have a set of 10.5:1 Wiseco pistons now. But I think your right about the 114 lobe centers. After thinking about it, I went and put them back. Did you ever set a degree wheel on your crank, or are you going strait off the cam gear marks? I did put the degree wheel on but I couldn't really see it very well without removing the radiator. In the end I checked the exhaust valve closing and inlet valve opening events at the 50 thou lobe lift points and they agreed exactly with the timing card and the straight up zero marks on the cam wheels. At this point I was satisfied that the cams were correctly degreed and I just decided to start tweaking from there. As I said earlier they are now both advanced by +3 degrees. As far as ignition timing is concerned I have tried 12,15, and 18 deg static advance and it seems to go best at 12 deg. Strange though no pinging at any of these settings. Just surfing the forums & came across this interesting data. I guess the old dog isn't so bad after all ! Wow, that is a hell of a lot of variance in bearing journal size ! I wonder who BC actually had them made by ? Now I know why its impossible to find a clear large picture of these cams, covering the important sections, even though various people are selling them. Even the picture Kyle took of the 272's shows scuffing on one of the journals if you look closely. Overall numerous hurdles with these things so hopefully their performance will outweigh the annoying issues along the way. Never seen where plasti-gage was needed on a cam before, but with tolerances that erratic, I sure would check. If you end up with less than .02mm clearance, you may have problems. If you start off with both cams set at +3 advance you will hopefully find that you are close to the optimum settings. Overall I have found the performance gains to be worth all the effort and really the only thing I could seriously grumble about is the original ignition timing issue that I posted up. BTW I scoured the crower cams website and found a timing card for a very similar cam designed for the 2jz engine and on the crower cams timing card it says to set up the inlet cam on 106 degrees Lobe centre angle. This corresponds to +2 cam degrees advance. Crower cams and Brian crower are related somehow but the crower cams website is far more comprehensive and informative. Update. I have reinstalled the supra intake and tested the car with the ACIS valve open and closed. With these new cams I now get a much stronger response from the ACIS system I guess due to the larger valve overlap. My performance now on LPG is better than it was before on unleaded. I think my next step will be to install your ported exhaust manifold. I'm also still hunting for a 4.1 or 4.3 diff. If this forum had +rep like toymods I'd be dishing it out. Also I got a copy of the book "4 stroke performance tuning" about a week ago and I can't put it down. It has really informative info about how to set up cams and what to expect when you mke a change. It is a really good resource for the NA tuner but doesn't talk much about forced induction. Looks like No1 for the intake is just barely in spec., but the exhaust is .015mm to big. Might need to have it turned down a bit. I think I have fixed the idle issues with the air con off. I managed to trick the ecu into thinking the A/C is always on so minimum idle speed is now about 700rpm. I will wait and see how it runs before posting how I did it. I should know within a day or so if there are any side effects. OK here is the bodge. Seems to work but I highly recommend you get a spare ECU and try it on that first. Do it at your own risk. 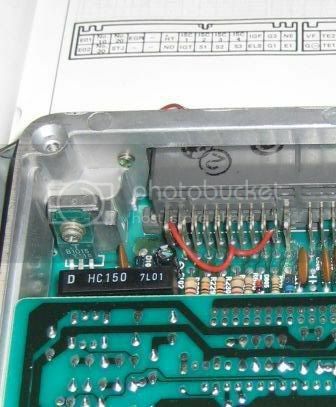 Basically cut the A/C pin of the connector on the back side inside the ECU and jumper it to the B+ pin. That way the ECU thinks the A/C is always on. Well I finally installed the cams last night, setting the valve clearance at pretty close to 8 thou intake & 10 thou exhaust. Put them as close to 0 & 0 as I could see, didnt have to be 100% accurate as I have adjustable cam gears on both which gives me +/- 12 degrees to play with. Cranked it over & you were right Andrew it idled like crap, could not get any more than about 5 degrees of static timing. Reset both cams to +3 & ran the cams in for about 30 minutes at varying speeds from 1500 to 3000rpm. Let it settle for a while & changed the oil & filter. Even at +3 the idle could be classified as 5/10 at best. I would STRONGLY recommend installing both cams to at least +2 & tuning from there. +5 exhaust & +2 intake (112 1/2 LSA), -5 valve overlap, idle is reasonable, performance is good down low & gets much better as the revs rise. +4 exhaust & -4 intake (110 LSA), 0 valve overlap, idle reasonable, performance only fair down low but very good at 4000+. +4 exhaust +4 intake (114 LSA), -8 valve overlap, rough idle (just driveable) but very good performance. Will have to try a whole stack of different settings but the idle quality is only going to be fair at best running the standard ECU. From the little bit of driving I have done the performance is very good & only gets better as the revs rise. For someone installing them with a standalone engine management they will be very happy once they are tuned properly. Will put the car on the dyno in the next fortnight & see how the figures compare to my previous setup running the turbo intake cam. Looks like your cams have responded exactly the same as mine. Have you noticed the lovely exhaust note you get with the exhaust cam advanced. Sounds like a Ferrari or something like that. Mine are both set at +3 advance ATM. My idle quality is good now except when cold it seems a bit ordinary. My shims are set at a slightly bigger clearance though. About 13thou exhaust and 11 thou inlet. This improved idle quality and general driveability but I do think I lost a little power after increasing the valve clearances. BTW if you want to get your hands on a spare ECU I am happy to do the mod for you. That way idle set point is never below 700rpm. I dont think the ECU likes the negative overlap of around -8 or more. Under that figure its reasonable. You can definately feel the strong pulses when you put your hand behind the exhaust pipe at idle. Will see how the car drives, when the weather clears, with my preferred setting of -3 & +4. I certainly would not be put off by what has been said in this thread. The 272's have more aggressive specs, & will probably be more effective after 4,500 rpm compared to the 264's. All we are saying is that they are not a straight drop in & expect perfect idle/manners. They need a bit of tuning to find out what your engine likes as most engines are different based on machining etc. The performance is very good & WELL WORTH FITTING. As with any cam change with any motor I've modded, the more you do to make the motor breath better, the better thr cams will work. Tuning plays a big part of it, if you tune it wrong sometimes they will hurt performance, and if they are more cam then what you need the same thing may happen. Well I would agree and I have the same cams. But this is not proof, just the experience of the only two people I know of that have fitted these cams and played with the timing. More fiddling with cam timing setting & found that 0 Intake & +4 exhaust ( 44 degree overlap) idles very good & I would use this as a starting point setting if installing these cams for the first time. With this setting you can obtain a lot of static timing advance avoiding having to file the dizzy slot. If you do not have adjustable cam gears have a look at the picture below as the stock gears have identical teeth to this & you can use it as a guide. Where did you get the seat to seat timing info?? And how do your cams perform with those settings. Instead of filing the dist. hole, use electronics. I just used the knobs on my Apex Super-ITC to dial in the timing when I put cams in or change the exhaust cam setting. It gives me +/- 15 degrees.